Sonic returns to Green Hill Zone, and something's different. I've been fairly ambivalent about Sonic Mania until now—a couple of decades' worth of bad Sonic games will do that to you—but the latest trailer really tugged at my nostalgia, illustrating how a classic Sonic 'zone' has been reworked and expanded upon for this unusual official/unofficial Sonic mashup. I didn't notice many of the differences to Mania's remixed Green Hill Zone until the video's narrator pointed them out, but they include the addition of Tails, the chance to play as Knuckles, and the inclusion of new or shifted around power-ups, such as the Fire Shield. 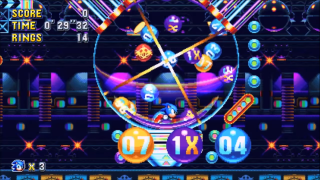 However, once the SEGA employee demonstrating the game reaches the second act of Green Hill Zone, the changes became more clear. This act is basically entirely new, drawing on the original, unused design of the area to take Sonic and friends further into Green Hill, and with a seamless transition between each level to boot. Sonic Mania will run at 60fps—the narrator says the Mega Drive originals ran at 30 frames-per-second, although this claim is disputed by the YouTube comments below the video. Either way, it looks pretty swish, particularly if you watch the trailer on its highest setting. Sonic Mania will release sometime this Spring, and it is basically remixing my childhood.